I have a confession. Up until this afternoon I had NEVER eaten a Clinker before in my entire life – crazy I know. 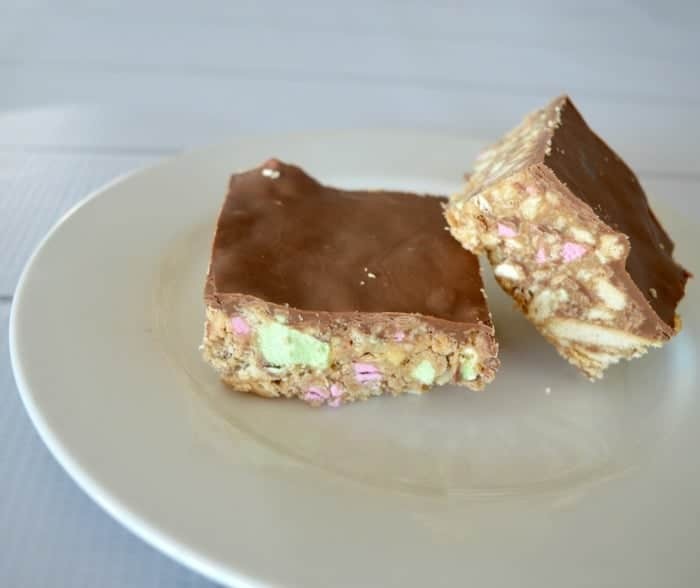 After spotting bags of them on special at our new supermarket yesterday (which I’m a little excited about) I decided it was time to try these little delights and thought what better way to taste them for the first time than in a yummy no bake Clinkers Slice. 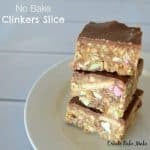 This recipe for Clinkers Slice has a lot of similarities to many of the other no bake slices I’ve made in the past. As I had condensed milk leftover, I decided to ‘revamp’ my Caramello Slice – new pictures coming soon. 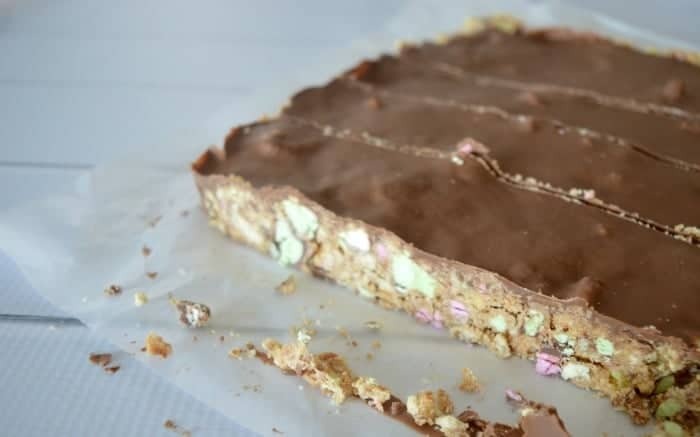 As eager as the boys were to try this one, I decided it’s a little too naughty for them, so instead they satisfied their never ending hunger with a piece of muesli slice – perfect as this leave more for me to enjoy. Now that I’ve discovered these little treasures, I’m eager to make more recipes with them – so please hit me up with your suggestions! Line a slice tin with baking paper, making sure you leave plenty hanging over the edge to help you lift the slice out of the tin later. Crush the biscuits and Clinkers into large pieces using a food processor - a rolling pin will also work! 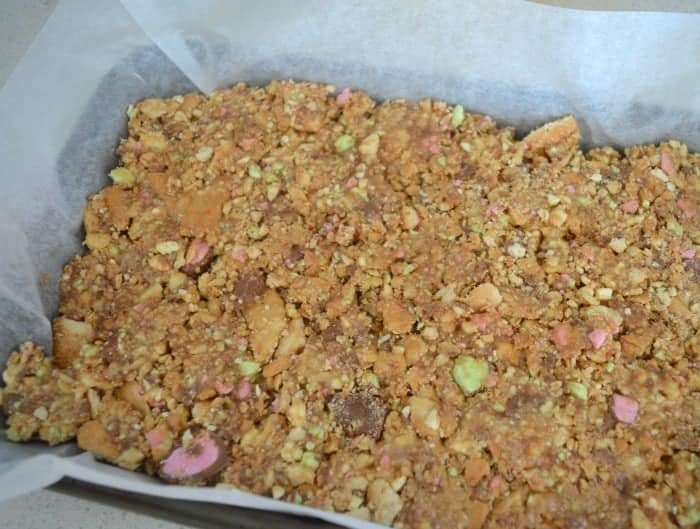 Place the crushed biscuits and clinkers into a large bowl and set aside. Place the butter and condensed milk into a small saucepan and cook it over a low heat until the butter has melted and both ingredients have combined. 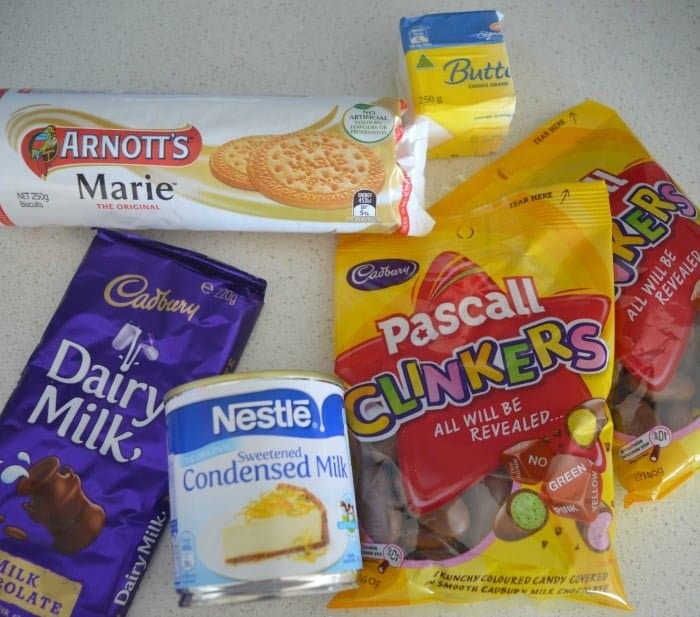 Pour the combined condensed milk and butter into the bowl with the crushed biscuits and Clinkers. Use a large metal spoon to mix together. Pour the mixture into your lined baking tin and use the back of a metal spoon to spread the mixture evenly across the tray and push down to create a flat surface. Break the milk chocolate into small pieces and place it into a microwave safe bowl. Cook for 30 sec spurts (stirring in between) until the chocolate has almost melted. Remove from the microwave and stir until completely melted. Pour the melted chocolate over the top of the slice and place in the fridge to set (preferably 4+ hours). Remove the set slice from the fridge and cut into small pieces. Place the Clinkers and biscuits into the Thermomix bowl and crush for 5 seconds on speed 3 or until they have broken into bite sized chunks. Pour the crushed Clinkers and biscuits into a large bowl and set aside until needed. Place the butter and condensed milk into the Thermomix bowl and cook for 2 minutes 30 seconds on 60 degrees, speed 1 or until butter has melted and the ingredients have combined. What popular chocolate bar or lolly have you never tried? We might have to organise a special delivery for you I think! It certainly would be perfect with a cup of tea! You had me at Clinkers … oh, and no bake! Yummo! haha, no bake are two of my favourite words too. thero mix>? never heard of it will it still work if you make if on the stove top ? Thanking you kindly Beverley. Oh my gosh!! You also had me at clinkers too!!! This looks delicious!!! Oh my gosh…I would have never thought of using clinkers in a slice! This is so naughty!!! It’s not one for those watching what they eat! Yum yum yum!! I am sitting on the couch thinking about how tight my pants feel but I am going to make this on the weekend for the family. Thanks for sharing. I live in South Africa and we don’t have Clunkers here. What can I use as a substitute?